Penthesilea was an Amazonian Queen from Greek mythology. She was the daughter of Ares and Otrera and the sister of Hippolyta, Antiope and Melanippe. One of many famous Amazonian Queens, Penthisilea’s story is one of fierce dedication to being a warrior, and a tragic death at the hands of Achilles. As an Amazon, Penthesilea was a member of a legendary race of warrior women. The Amazon women were so dedicated to being warriors, that they were known to cut off one of their breasts so that they would be better able to wield a bow. Whether this is true or not is debatable. Penthesilea was highly skilled with weapons, she was very wise, and she was beautiful. It has been said that she invented the battle-axe. While hunting one day, Penthesilea accidentally killed her sister Hippolyta with a spear. This caused Penthesilea a great deal of grief, and led her to wish for death. However, as a warrior, and an Amazon, she could only die honorably and during battle. Penthesilea’s reign as queen was during the years of the Trojan War. The Amazons did not take a particular side in the war, and Penthesiliea made an effort to stay away from the conflict for the most part. However, when Achilles killed the Trojan prince, Hector, and upon the accidental killing of her sister, Penthesilea decided that it was time for the Amazons to intervene, so the Amazons moved in on Troy. During the war, Penthesilea was not a queen who sat by and watched the men fight. She was a warrior in the truest sense. It is said that she blazed through the Greeks like lightning, killing many. It is written that she was swift and brave, and fought as valiantly and successfully as the men. She wanted to prove that the Amazons were great warriors. She wanted to kill Achilles to avenge the death of Hector, and she wanted to die in battle. 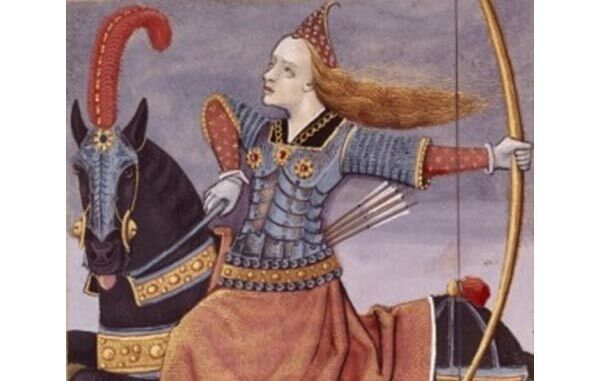 Although Penthesilea was a ferocious warrior, her life came to an end, at the hands of Achilles. Achilles had seen her battling others, and was enamored with her ferocity and strength. As he fought, he worked his way towards her, like a moth drawn to a flame. While he was drawn to her with the intention of facing her as an opponent, he fell in love with her upon facing her. However, it was too late. Achilles defeated Penthesilea, catching her as she fell to the ground. Greek warrior Thersites mocked Achilles for his treatment of Penthesilea’s body after her death. It is also said that Thersites removed Penthesilea’s eyes with his sword. This enraged Achilles, and he slaughtered Thersites. Upon Thersites’ death, a sacred feud was fought. Diomedes, Thersite’s cousin, retrieved Penthesilea’s corpse, dragged it behind his chariot, and cast it into the river. Achilles retrieved the body, and gave her a proper burial. In some stories, Achilles is accused of engaging in necrophilia with her body. In other legends, it is said that Penthesilea bore Achilles a son after her death. 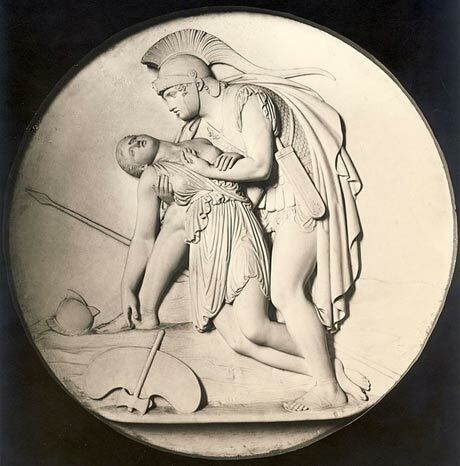 Achilles cradles Penthesilea in his arms after killing her. Image source . The ferocious Penthesilea, gold belt fastened beneath her exposed breast, leads her battle-lines of Amazons with their crescent light-shields…a warrioress, a maiden who dares to fight with men. He used the word “Bellatrix” to describe her, and it is rumored that this was JK Rowling’s inspiration for the naming of Bellatrix Lestrange in the Harry Potter series. Penthesilea’s story is not told in the Iliad. The Iliad ends with Hector’s funeral, before the Amazons had arrived to avenge his death. Her story is told in the lost epic Aethiopis. Penthesilea’s life and death were tragic. She is portrayed as a brave and fierce warrior who was deeply affected by the accidental death of her sister. This grief, compounded with her desire to be a strong warrior who would die an honorable death on the battlefield, led her to Troy, where her tragic death weakened Troy, but also led to unrest in the Greek camps due to her death’s impact on Achilles and his revengeful acts. In the end, she died the ‘honorable’ death on the battlefield that she had longed for, at the hands of the legendary Achilles, no less.